When I asked my daughter Maya what she wanted for her 8th birthday party she had lots of crazy, insane, over the top ridiculous very well-thought out ideas, but the one she held dearest of all was this, that there should be a disco ball. Happy to oblige, my little disco dancing star. I like this picture. Very colorful! Your disco balk bring sback happy memories of a birthday party here when my eldest was about 8! Went to visit that site- it's great and will keep it in mind for gift shopping. disco ball for the win! And now off to check out this store. John Travolta ? no, he is too old and "round" now, lol ! I think he would dance like an elephant ! 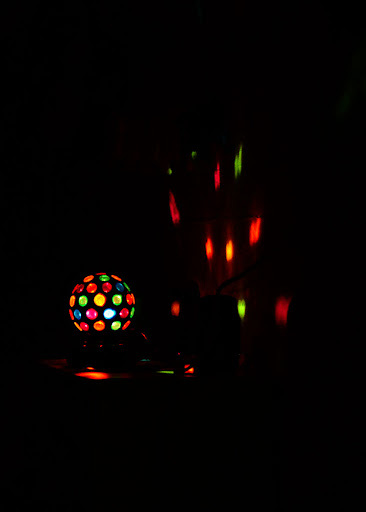 A disco ball, oh, sweet nostalgia. Great picture of the colourful reflections. Hope her party came out equal beautiful. PS Off now to check out that great-sounding store! How sweet a request. Hope she had a great 8th birthday celebration. And you obliging her...that is terrific.